Buddy Boeheim, Syracuse coach Jim Boeheim’s son, had his last name misspelled on his jersey in No. 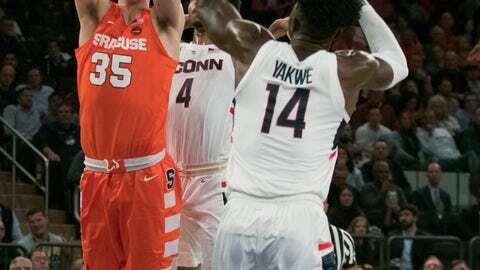 15 Syracuse’s 83-76 loss to Connecticut on Thursday night in a 2K Classic game at Madison Square Garden. The 6-foot-5 freshman’s name was spelled “Boheim.” He said he wasn’t aware of the mistake until after the game. His father has been coach at Syracuse since 1976 and has won 928 games, including a national championship in 2003. “It’s kind of ironic,” Buddy Boeheim said. The younger Boeheim had one point and an assist in six minutes.